According to rental site Zumper, median rents for a one-bedroom in Evanston are hovering around $1,495. But how does the low-end pricing on an Evanston rental look these days--and what might you get for your money? We took a look at local listings for studios and one-bedroom apartments to find out what budget-minded apartment seekers can expect to find. Listed at $825/month, this one-bedroom, one-bathroom apartment, located at 11-21 Dryden Place, is 44.8 percent less than the median rent for a one bedroom in Evanston, which is currently estimated at around $1,495/month. The building offers assigned parking and on-site laundry. In the unit, look for both air conditioning and central heating, carpeting and wooden cabinetry. Feline companions are allowed. According to Walk Score, this location is friendly for those on foot and has good transit options. This studio, situated at 327 Howard St., #339, in Howard Street, is listed for $875/month for its 344 square feet of space. In the apartment, expect to find hardwood flooring, central heating, a dishwasher, granite countertops, stainless steel appliance and wooden cabinetry. On-site laundry is offered as a building amenity. For those with feline friends in tow, know that cats are welcome on this property. Walk Score indicates that this location is very walkable, has some bike infrastructure and boasts excellent transit options. Here's a one-bedroom, one-bathroom apartment at 1510 Central St. in Central Street, which is going for $925/month. The building features on-site laundry. In the unit, anticipate central heating, hardwood flooring and wooden cabinetry. Pet owners, inquire elsewhere: this spot doesn't allow cats or dogs. According to Walk Score, the area around this address is quite walkable and has good transit options. 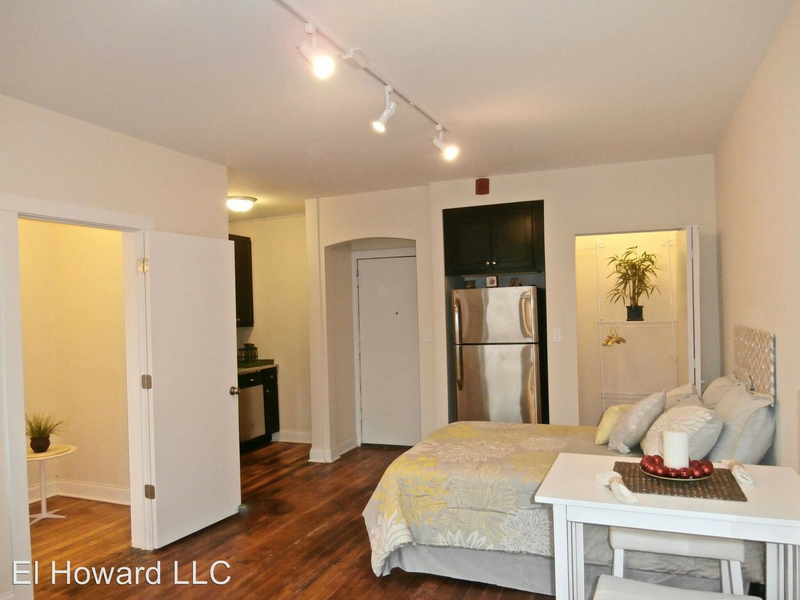 Listed at $995/month, this studio apartment is located at 909 Elmwood Ave., #O3 in Main-Chicago. When it comes to building amenities, expect outdoor space and on-site laundry. The unit features hardwood flooring, wooden cabinetry, French doors and a balcony. Good news for animal lovers: both dogs and cats are permitted here, though limitations and extra fees apply. Walk Score indicates that the surrounding area is extremely walkable and offers many nearby public transportation options. Finally, listed at $1,050/month, this one-bedroom, one-bathroom apartment is located at 549 Sheridan Road, #549-b1. The building offers available assigned parking, outdoor space and on-site laundry. Apartment amenities include air conditioning, hardwood flooring, high ceilings, a ceiling fan, a dishwasher and wooden cabinetry. Feline companions are permitted. Walk Score indicates that this location isn't very walkable and has some transit options.